Lands’ End started out in Chicago, Illinois, in 1963; first as a supplier of sailboat equipment for racing sailors, and then, as a mail-order operation, driven by 32-page, quarterly catalogs. While in 2010, the company continues to stay true to its original roots, in terms of “quality, Americana-styled merchandise for men, women, and children at value prices”, the Lands’ End name has also come to symbolize a growing roster of international, brick-and-mortar stores (think about the 300 Lands’ End signature shops at Sears), along with an expanded e-commerce website, first launched in 1995. 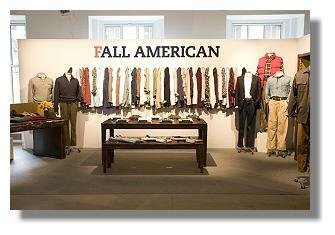 In order to continue to play up its name, image, credo, and brand to the fashion and business press, in conjunction with the launch of its newest Fall/Winter 2010 Collections, aptly termed, “A Beacon for What’s Real: Fall in Love with American Classics”, the company recently hosted an event in New York City. 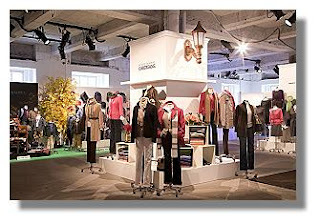 Hooking into its own venerable and historic tradition, Lands’ End opted to host its event in the like-wise venerable and historic Rockefeller Center Building, adjacent to the landmark Rockefeller Plaza area. Arriving at the never-easy-to-find entrance to the building, and then, once inside, having to pass through Security (always a pleasure), guests were welcomed into the airy and brightly-lit space by a plethora of the company’s representatives (PR and otherwise). Sipping cocktails and nibbling on deluxe finger-food; both of which were most plentiful throughout the evening, guests had the chance to view the diverse array of offerings on their own or with one of the company’s people in tow, should there be questions and answers required, during the walk-through. Generally, the presentation was well done, if not a bit, over the top, in terms of exactly how very much merchandise (and in some cases, way too much merchandise) there was to look at throughout the room. There were separate classifications for each of the company’s categories, and as such, some merchandise was shown styled casually on mannequins (pretty nice in most cases); vs. other types of goods shown simply; folded and laid-out, either on top of and, or inside vintage cabinets. 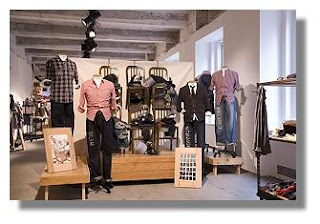 In all cases, the idea appeared to be for guests to be able to have quick and easy, touchy-feely access to all of the merchandise being shown, which is what one would not only expect to find in this type of presentation, but also what Lands’ End wants to serve up to its shoppers in the stores. In general, the majority of the seasonal goods looked good and are definitely priced to sell. Obviously, this is the company’s raison d’etre, in terms of providing mass market shoppers (singles and families) with a reason to look for, purchase and wear what Lands’ End has to offer. But, this kind of thinking also poses a few problems, most notably, while there surely are many options for the Lands’ End customer to consider; mostly at good prices, there also seems to be a confusing number of pieces, which might be unsettling for shoppers who do not have a strong sense of style. So, unless the shopper has the savvy to pull it all together, some of the merchandise that should not get lost in the shuffle in the stores, might get lost in that in-store shuffle. Worse yet, some of Lands’ Ends’ merchandise could get completely by-passed for other easier-to-shop-and-put-together collections. And, that would be a shame, because overall, there are some really great pieces in the mix here. All that may be needed to pull everything together in a more simple, easier to understand way, could just be a more watchful and mindful eye towards the process of editing and cohesiveness. 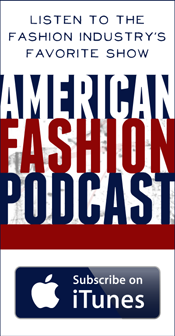 Many of the super-casual, mostly covetable women’s pieces, especially the luxury basics (“Cotton a la Mode), and an expanded sweater grouping that is most fashionable in its “look of Cashmere but costs like cotton” theme. Menswear pieces, which are generally gentlemanly-refined and pulled-together, via eased shirtings for sport and dress-wear; hunky, chunky sweaters that just about every guy will want to own and wear; lots of five-pocket jeans in multiple washes of denim, colored denim and cord; chinos and khakis, rendered in Traditional and Tailored fits. Expanded Canvas collections for women and men, which broaden out from last Spring’s launch, to showcase more of the category’s signature look of classic, lived-in fashion, which, while mixing what the company calls, “Authentic Inspiration and Modern Interpretation”, begs the question “What will you make of it?” to customers. Capsule Home line of organic bedding and bath offerings, including, among the best of this category, four cozy throws, priced at under $100. In particular, the knit wool-blend throw, available in five pretty shades, marries well with a matching, decorative pillow, making the whole deal what should be an easy, impulse buy for the shopper who desires this type of look. 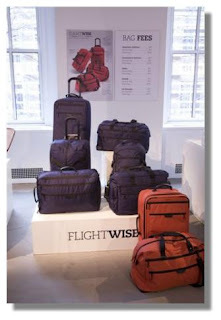 Hooking into all of the above is the new “Flight Wise” luggage collection, featuring a host of colors, and centered on soft, lightweight items, such as a trip tote, backpack, soft-sided travel bag, expandable duffle bag; 22-inch wheeled duffle and 22-inch upright wheeled bag; all under what the company says are the TSA’s federal guidelines for carry-on items. Putting itself top of mind with invited guests at the event, the company allowed each attendee to choose a piece of luggage, in a desired color, from among several pieces and color-ways available during the evening. As a special bonus and really nice touch, each guest had the option of selecting a particular, hand-embroidered monogram style, which was then added to the front of the chosen piece of luggage. 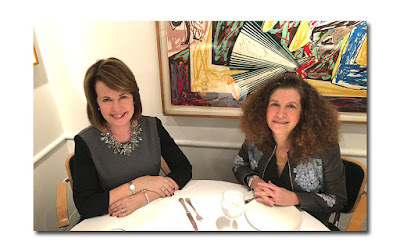 Not content to merely serve up a myriad of fashion items for its customers, Lands’ End also beyond the fray, in order to show that it has another, more charitable side, apart from just the company’s business face and profit margin, be all and end all. 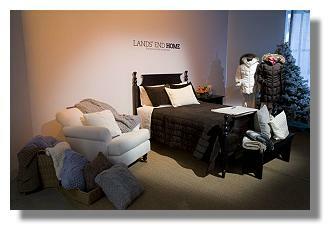 To do just that, Lands’ End created the “Way To Grow” Campaign, which ran from April through May, 2010. The initiative, which celebrated the 40th Anniversary of Earth Day, additionally offered nationwide schools the opportunity to win money to fund a particular gardening project or science initiative. The fifteen schools receiving the most votes received between $500 and $2,500. “Way To Grow” was hyped on the company’s website (www.landsend.com/thehub) where those who entered within the deadline period were eligible to receive a packet of organic, Russian Mammoth Sunflower seeds, with their online orders of any Lands’ End childrens’ merchandise. Additionally, there was a cool, “Way to Grow” party on Twitter, featuring gardening tips and fun giveaways, such as organic seed collections, gardening totes, gardening books, and of course, Lands’ End gift cards. I love your blog, you always give me good ideas !!! so.... thank you, thank you and thank you!!!!!!! I invite you to visit this website www.mintmelon.com It´s a special spanish fashion brand, I think you'll like it, they send all around the world. It´ll be a great experience for you. You have a great blog! Very informative and inspiring. I look forward to reading your posts! I'm excited to check out the selection...hopefully I can find a few items to fill out my summer wardrobe.